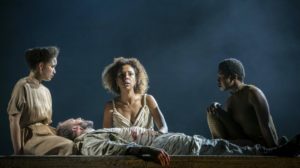 Anthony and Cleopatra runs at the National Theatre until 19th January – we were lucky enough to see it on Saturday. There are no tickets left for the rest of the run, it’s a sell out, so I cannot recommend that you go, though the 6th December performance is being streamed live to cinemas around the country, so that would be a way to see it. It is well worth seeing. The staging is set in ‘an imagined present’ so, suits and battle fatigues, holiday gear and office clothes – though Cleopatra wears a series of gorgeous gowns as befits the Queen of the Nile. The gradations and differences are still present, Caesar wears an admiral’s uniform, all braid and buttons, untouched by blood, gore or dirt, whereas Anthony has an army general’s uniform, less braid, more medals and, at the last, bloody battle fatigues and armour. The production makes full use of the Olivier Theatre’s revolve and under-pit as we switch between Alexandria, rich aquamarine pools and loungers, cocktails and cold beers and Rome, all greys and whites, with Starck-style furniture and video screens. The performance begins at the end, a change in the text, with Caesar and his court at Cleopatra’s monument and the words of Philo, which usually start the play, are spoken by Agrippa. Thus “The triple pillar of the world transform’d Into a strumpet’s fool: behold and see.” leads into a play-long flashback. This is neat, it works very well and, after all, everyone knows the ending. It’s not the only alteration. So we have Anthony singing a song about old age and the increasing ravages of time during the gaudy night of celebration after the deal has been struck with young Pompey. It shows him as the life and soul of the party, as distinct from prim Caesar, but also makes him vulnerable. Again, this works in a play which is about duality, the contrasting binaries of Alexandria and Rome, masculinity and femininity, old and new, with the title characters epitomising all these within themselves. 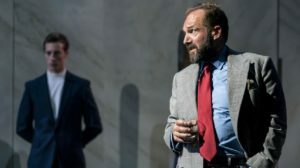 This play, more than most, depends on the performances of the leading two actors and, as the reviews have said, Ralph Fiennes and Sophie Okonedo are at the very top of their game. Okonedo manages to show the domestic and personal Cleopatra within the Queen, her rages and jealousies always have to be superhuman, given that they are those of a goddess, yet she is momentarily stricken into mute incomprehension when Eros tells her that Anthony is married. She is also funny and makes Cleopatra so. 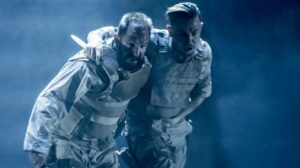 Fiennes just commands the stage whenever he is on it (with the exception of Okonedo) but plays Anthony as someone whose doom is already within him, a man who, while he wants all the power and majesty ‘to be Anthony’ no longer has the stomach or will to fight to retain it. The supporting cast is good, Tim McMullan as Enobarbus, Nicholas Le Provost as Lepidus, Katy Stephens as Agrippa ( a gender change which works ). 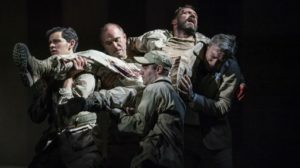 Tunji Kasim catches Caesar’s personal fastidiousness and how he cannot ‘fit in’ in the way that Anthony can, but also his calculating hypocrisy ‘The time of universal peace is near.’ The production hints at a physical relationship between them, as has become customary, with Caesar being boy to Anthony’s man, something the former would like to forget and the latter not allow. I confess I found Caesar’s accent moved about somewhat – was that deliberate? It was a little distracting. Saturday’s audience were entranced, there were more than a few gasps at certain points in the play, as well as laughter and people were on their feet at the end of it. The last Shakespeare I saw this year was the excellent Julius Caesar, so to follow with Anthony & Cleopatra was ‘ten years later’. If you can catch the cinema showing, go see it. Photographs by Johan Persson from the National Theatre’s web-site. This entry was posted in Culture Vulture and tagged London, Worth a visit by juliej. Bookmark the permalink.